Next Article This Is My 200th Story! Will It Be My Last? Oh I love art that’s outdoors. Makes art more accessible to so many more people. Art galleries can be very intimidating. Hi Suzanne. I like galleries, but outdoor art works take on a whole different feel, the way they fit in with or contrast with their settings. Thanks for dropping by. Appreciated! 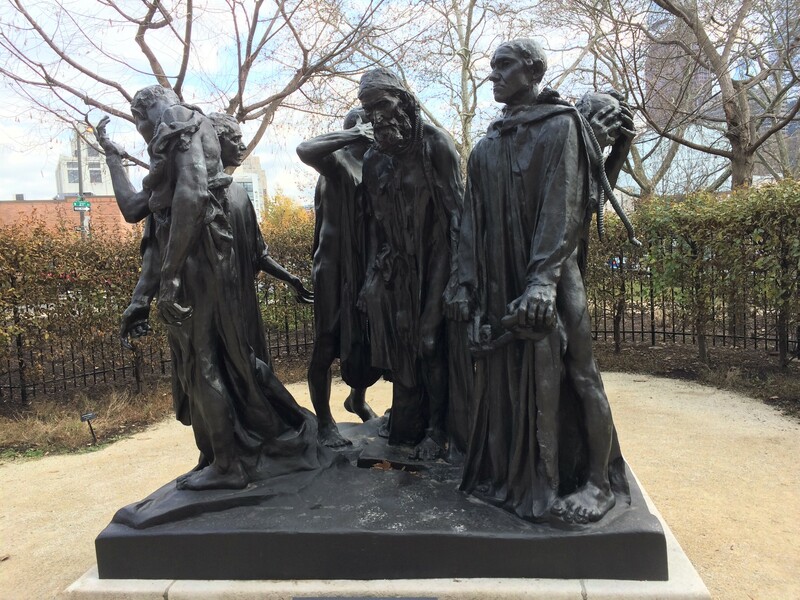 What an eclectic mix of sculptures you have in Philadelphia – the 13th Century Burghers of Calais indeed. Fine pictures despite the premature shutdown of the camera phone. Moral of the tale – carry a spare battery charger with you. I now never leave home without it (only to find it is sometimes “out of juice” too!). Of course that should be 14th century. 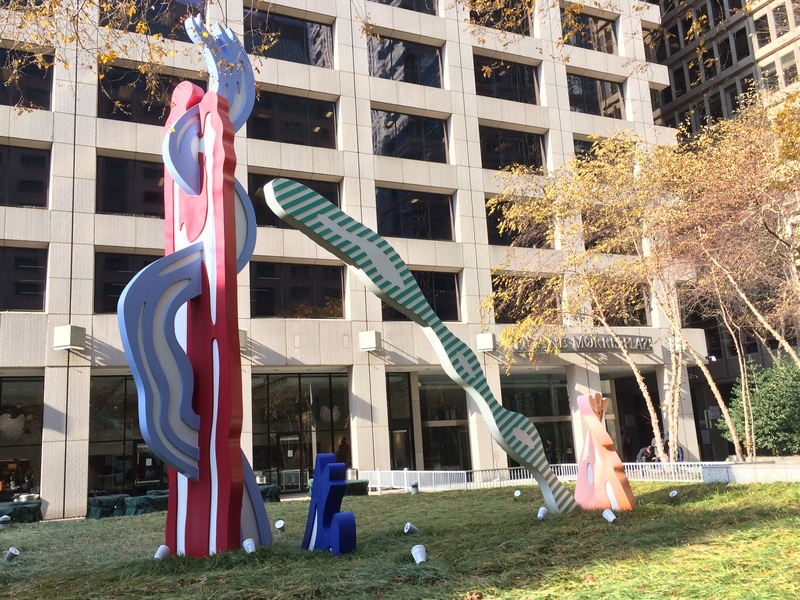 Philly is a treasure trove of outdoor sculptures. and also of murals that are painted on the sides of buildings. It’s a good city! So glad you did write the story. I enjoyed the tour of Philadelphia’s sculptures. Thanks. It’s a good city to wander around in. You never know what you’ll find. 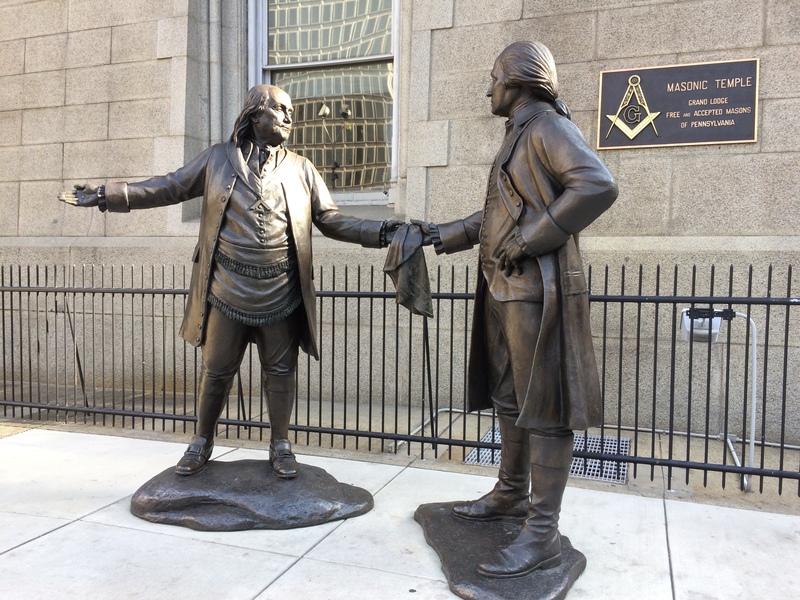 I was surprised to discover the Franklin/Washington sculpture, for instance. Life’s like that; not always going as planned but you made the best of it and the story was worth telling and reading. And I’ve learned two new words: “natch” and “traffic rotary” – “naturally” and “traffic roundabout” to me! I’ve picked up some words from your stories too! Nice tour. Several good books on Phila sculpture. I haven’t been to Philly in decades. The sculptures throughout the city sounds appealing. Nice shots. Hello Cindy. Philadelphia has a lot going for it. It’s culturally strong. Lots of restaurants. Beautiful parks. I’m a fan. Franklin and Jefferson were a lot more colourful than I suspected. Thanks for this interesting insight into a place that’s on my list of cities to visit. You’d enjoy Philadelphia. If you visit, seek out some off-the-beaten-path places and activities. There are tons of good things in those categories. I also like the sculpture pictures as well. Reminds me of the 40 years l walked around town while working in the city. Thanks for the memories . Hi Joyce. You and I both have racked up countless miles wandering around the city. It’s a fascinating place. Wowsah! If ever I come to Philadelphia… All so different and all so fascinating. It goes to show that like photography, sculpture is not obliged to be any one way. You’re absolutely right. There’s a whole lot of variety out there. And they are not something most tourists would think to look for. The statue and the story of The Burghers Of Calais is compelling. What a story of courage and sacrifice! I can’t imagine anything even remotely similar happening today. You know, I hadn’t seen that sculpture in years. But I’ve seen it three times over the last few months. I think it’s one of the very best things to see of any kind in the entire city. Good grief you’ve just added to my TBR pile–“Note to self: Read Ben Franklin’s book with the really long name”. OK, now for your article. Glorious pictures, every one. The first–zoom pixelated maybe? Although it came out fine from he distance. Who knew there was a statute to Ben’s kite flying experiment? I wish I knew what caused the problem. Maybe the cold weather put a big strain on the battery. I suspect that it’s time for me to get a new phone, although it’s working pretty decently again. Thanks for stopping by. See you! One thing is sure about ‘phones…they always let you down when you need them, but you beat the thing and produced this super post. I’d seen the burghers when in Calais where they stand in a pretty moserable park..,had no idea that Philadelphia had them too! Hi there, Helen. I think that five or six casts have been made of the statue. One of them is in Paris. I’ll have missed that one, then! Paris was never a favourite place to visit…. That’s a great collection of sculptures. That happens to my phone in cold weather too. I don’t think the battery can cope with it, especially as it ages. One minute it appears to have 50% or something, the next it’s dead. That’s exactly what happened with my phone that day. It showed 45% or 50%, and then everything went black and inoperable. Rodin – as in the Thinker dude? Wow. 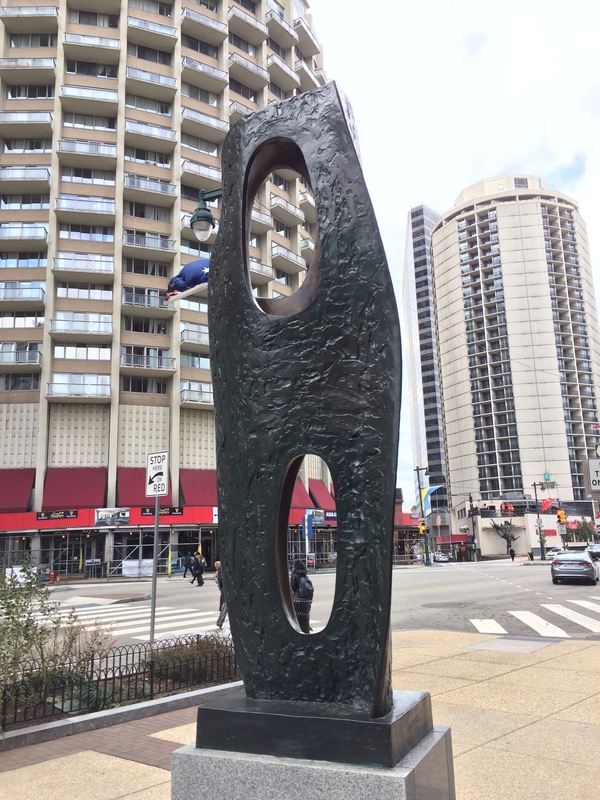 You’ve got a brilliant variety of sculptures in your city! And Ben Franklin talked a lot of sense. I can see why he inspires you. Hi. I can’t remember how or why, but Philadelphia has had a Rodin museum for many decades. A cast of The Thinker is placed right in front of the entrance. 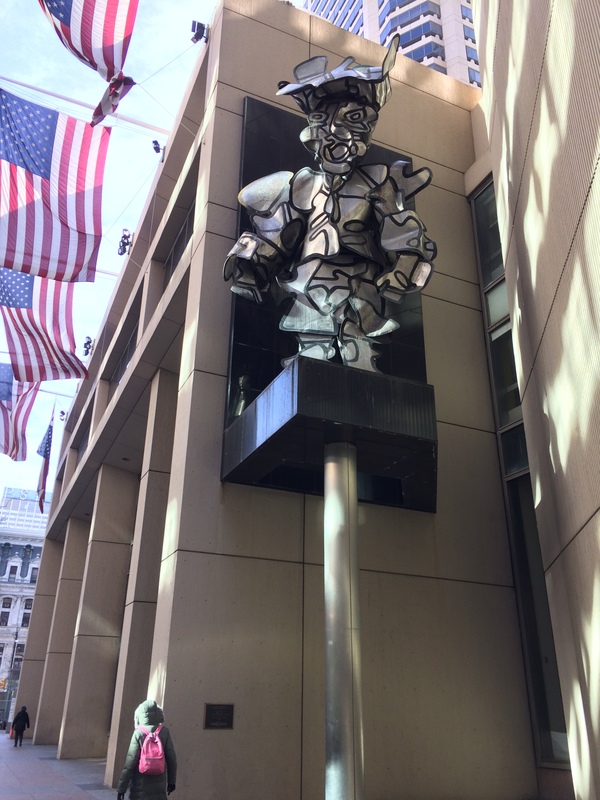 A great selection of diverse sculptures – and who doesn’t love Ben Franklin! Thanks for the walk about Philadelphia. Ben Franklin is an enormous presence in Philly, more so than anybody I think. Many places, both public and private, are named after him. Good that you wrote the post anyway. The sculptures you featured are interesting, not the usual one’s found in public places. They are interesting tidbits about your city. 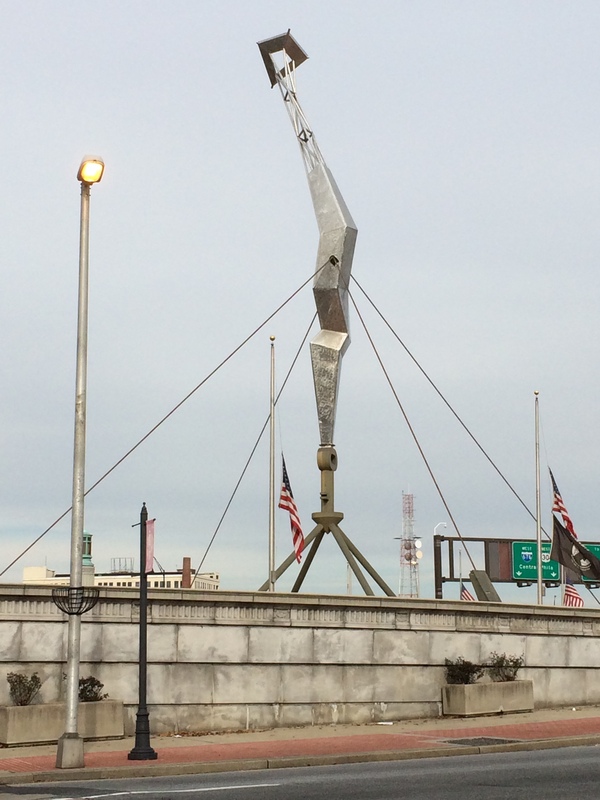 Right, it’s pretty neat that so many unusual outdoor sculptures are in Philadelphia. They add a lot to the city. See ya! Ah, The Burghers Of Calais. I saw them at the Musee Rodin in Paris (and one or two other places–they are promiscuous with their availability but nonetheless intriguing). Lucky they weren’t depending on TheRUMP or his toady McConnell for mercy. Your story with its “warts and holes” is just fine. As for things turning out the way we’d like them to, well that’s a crapshoot in a fixed horse race. Trump’s the worst. McConnell too. And let’s not forget Pence. At least the House Of Reps contains a fair number of normal people. Sometimes what we think is going to turn out to be flawed works out just fine! I’m glad I got a story out of it. Up until very recently I had no plans to write about it. Have a terrific weekend, Ann. Be seeing you! Sculptors who do outdoor art are a brave lot—for some reason, people love to criticize outdoor sculptures. It’s tempting for many to disparage it, especially if it has been financed by public funds. I actually love it—especially Rodin, and I’m sorry your camera let you down before your could take more pictures of The Burghers of Calais! Evening, Diane. The Burghers has become one of my very favorite artworks in Philly. It is a masterful sculpture. If I compiled a Top Ten list of things to do in this city, looking at The Burghers would be on the list. I like that “Milord La Chamarre,” it’s both funny and kinda scary, in a good way. It looks like a spin-off from one of those “Transformers” movies, but made out of puzzle pieces. Somebody this morning was just talking about those little backup batteries, that you plug your phone into, and he told me to save my money, he’d tried three different ones and none did him much good. But the shots you did get are excellent, I like the Roy Lichtenstein one too, and thought he just did paintings, I think I like the sculpture better. I like the Milord piece a lot too. I wonder how many people notice it, since it’s above ground and kind of tucked away. Yes, lots of art in the city, both indoors and outdoors. It’s one of the reasons I’ve lived in or near Philadelphia for most of my adult life. Here’s to a great weekend. See you! Nice shots of the sculptures before your phone got possessed. I like Nogushi’s bolt of lightning a lot. And I agree with Joanne Sisco above: if it was today, where the Rodin statue is concerned, like a bunch of millennials, say, they’d probably wonder if self-sacrifice came under the heading of “adulting” and if it was worth it or not. Anyone running the country today, naturally, wouldn’t even consider it! Hi Stacey. On an individual level, many people are brave, maybe not even realizing it. Probably braver than they think. These are diverse and interesting, Neil. Thanks for the tour. They reveal so much about the city, and I love how they mark the time and place. Have you considered setting up a formal tour of them? After returning from Havana recently, I’d say it would make for an interesting Airbnb experience when tourists come to Philly. Hi. Now, that’s an interesting idea. But I wouldn’t be a good tour guide. I’m better at wandering around on my own, or with my spouse or a friend or two in tow. Enjoy the weekend! Enjoyed reading your write-up and great pics of the sculptures. Bummer about the battery! Hi there. The battery situation threw me off. But eventually (weeks later) I came to my senses and wrote a story about the day! I’m not too familiar with Lichtenstein’s sculptures. I know more about his paintings. He was part of the pop art movement in the 1960s, but I bet he worked in traditional styles before he got into doing very colorful art. Take care, Jerry. Have a great weekend! The story of The Burghers of Calais is great and interesting. I enjoyed wandering alone the street and studying the details of the statues through your words and photos. Have a good weekend! Thanks, Isabelle. I’m always glad to hear from you. I hope the weather isn’t too bad in Norway. Much of the USA is under a severe cold spell right now. Bye! The temperature was down to minus 12-15 degrees earlier this week. I was almost frozen. Might be a piece of cake compared to some places in the states, I know. Talk soon! Hi David. I wonder if Ben “swore” very much. Wouldn’t surprise me if he did. See you! Many thanks, Tyler. I’ve been living in or near Philadelphia for most of my adulthood, and never get tired of wandering around the city. It’s a fascinating place in many ways. You might want to check out the 10 cast iron sculptures temporarily sited at the top of the Art Museum steps. Most of the tourists are ignoring them on their rush to the Rocky statue. Sigh. The Museum also has a great Claes Oldenburg sculpture, The Plug. Hi Debra. Thanks for the suggestion. I read about those 10 pieces. One of the sculptures I didn’t get to on December 6, because of my phone conking out, is the Nevelson work at the museum’s rear entrance. It’s one of my faves. It has been so long since I visited Philadelphia, I have only foggy memories. Definitely none of the varied sculptures you chose to show us. I should try to jog my memory by visiting again! If you ever go to Philly, let me know in advance so that we can meet in person. Love Franklin’s words of wisdom! If I could go out for coffee with any historical figure, I’d pick Franklin (after Leo da Vinci, of course!). Great post, Neil! I had a lot of fun going on the sculptural walk with you Neil. I’ve never been to Philadelphia so that made it even more interesting. Hey there, Michele. Thanks for stopping by. Philadelphia is well worth a visit. There’s much of interest to see and do there. I confess I have mostly only heard scary things about Philadelphia in recent times. I didn’t know it sported a series of wonderful sculptures, by famous people no less. In Kenosha there is a sculpture walk along a beautiful harbor. The sculptures are by, shall we say, emerging artists, but are delightful none the less. I’m glad ol’ Ben gave you a nudge. Hi there, Melissa. Philadelphia’s a cultural place. Lots of art, theater, music. Thanks for stopping by. Have a real good week! True, and I believe it was an early home of culture for our country. What I was thinking of was the extreme response of fans to their team winning. Right, a year ago there were huge crowds in celebration of the Eagles winning the Super Bowl. I suppose that some people were pretty rowdy, but basically it was fine. Ah. The media always exaggerates. It sounded like the crowd ran amok (one of my favorite words) and were over- turning cars and smashing storefronts. Yeah, some amount of that did happen, but not a lot (though, obviously, even a small amount is too much). That’s a great collection of outdoor sculptures! I enjoy attending art galleries, etc. and yet, I haven’t visited Philly is so long. Glad your wife and Ben gave you the nudge to write this post. Hi there. Yeah, I definitely needed a nudge. I’m glad the story emerged! Thank you Neil for opening up Philadelphia for me. I had never really thought of visiting before, but these sculptures are amazing so now it’s on my list. Oh, it’s a fine city in many ways — historically, culturally. Beautiful parks, good restaurants. Have a good week. See you. Wow, thanks. Brave of you, sharing you walk despite the mishaps of the day. Franklin’s good advice travelled well over the centuries. I’m impressed with Philadelphia, having a heart for the arts, even inviting Rodin and Barbara Hepworth into its streets. The latter, being placed strikingly between straight-line architecture. Hello there. The Hepworth sculpture is on a long avenue that contains a bunch of outdoor sculptures. It’s a good part of the city to wander around in. Have a great day. Many thanks for stopping by. Thanks, Dave. When I walk around the old part of the city, I often realize that I’m stepping on the same stones that Franklin and Jefferson and Washington and all those others used to walk upon. It’s pretty amazing to me. What an interesting city you live by, Neil. I loved all of your pictures – am tantalised by the idea that there should have been more, but I’m glad you listened to Sandy. The Burghers of Calais certainly does make a powerful impression. Cath, one day I’ll probably do a Part II in re outdoor sculpture, and I’ll be sure that my phone’s battery is in tip-top shape before doing so. Thanks so much for the tour Neil. My favorite was probably that big paintbrush, though they are all cool. Thanks for giving me a brief glimpse of another side of Ben Franklin. Hello Lynne. 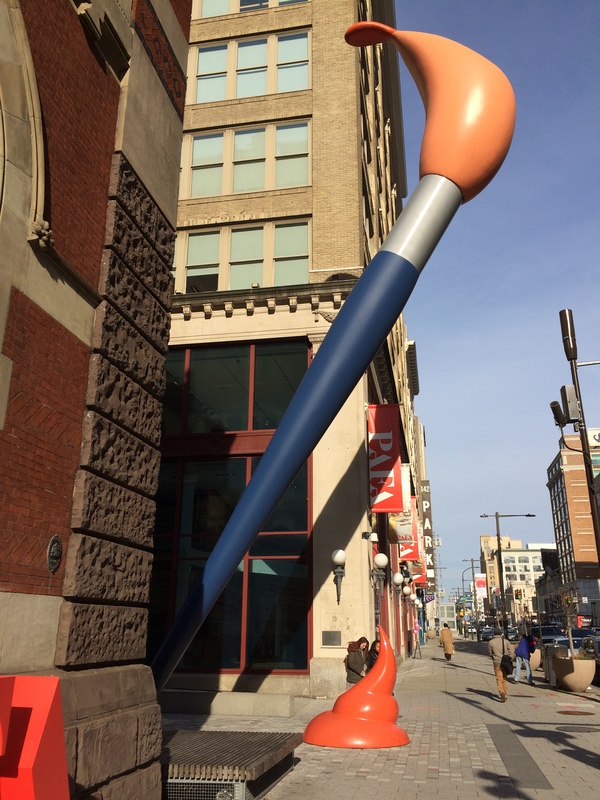 Claes Oldenburg, who did the paintbrush, has another real large work in Philadelphia. It’s a giant clothes pin. It’s good, but I like the paintbrush better. Thanks for venturing out to show this fascinating and eclectic collection of Public Art pieces. If you’d got round to many more that day we may have thought you weren’t giving each one your full attention! I like the lightening bolt – wonder if it’s ever been struck by the real thing? The one of the Presidents appears to me like Ben is inviting George to dance. Very impressed you’ve got a Barbara Hepworth piece there too. Thanks for visiting, Theresa. You know, I made a trip to that rotary in 1984 when I read that Bolt Of Lightning was going to be installed. I wanted to see the installation process. Noguchi was there that day, supervising the operation. Take care! Okay first, did Ben really say that?? I have to read this book. One of my fav quotes of his goes something like, “when the well runs dry you will know the value of water,” or something like that. He’s one of my favorite founding fathers. Although I’m listening to Hamilton so much lately that I’m starting to know all the words. But I digress. I enjoyed the sculpture tour. The Jefferson and Franklin statue is not far from my office. And Neil, really? You tried to get up close to the lightning bolt? Do you have a death wish?? :0) Great post! Morning, Pam. Yeah, I was all set to run to that rotary . . . until I saw the police car! Lucky for you because those cars stop for nothing and no one! What do Ben, Tom, Neil and CB have in common? F Bombers! The Burghers Of Calais. Very interesting stuff. You and me are in good company! Love the variety of this art walk. Wouldn’t mind a little trip down and about such culture m’self! What was unexpected that day for me was seeing the Franklin/Washington sculpture. It kind of took me by surprise, and really impressed me. You never know what you’ll find in Philadelphia! What wonderful and varied sculptures in your city and by so many famous artists. Really enjoyed seeing them. Love the playfulness of Oldenburg’s Paint Torch. Having a paint drip on ground level really encourages people to look up at the brush. Hi there. One of these days I’m going to do some research to locate outdoor sculptures in Philadelphia that I don’t know about. I’ll come up with a bunch of additional favorites in the process. Thanks for stopping by! Who knew old Ben was such a potty mouth? Great pics and sculptures. What a wonderful city you live in. Hey there. I moved to Philadelphia in the mid-70s, and have lived in or near the city ever since then. I never get tired of Philly. Lots to see and do there.